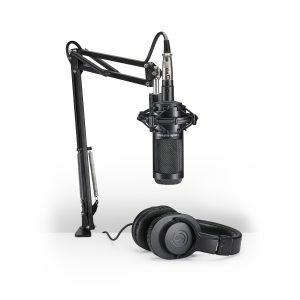 New microphone-headphone Audio-Technica bundles (AT2005USBPK, AT2020USB+PK) geared toward podcasters, videographers, live-streamers, YouTubers and beyond. Four new microphone-headphone Audio-Technica bundles catered to content creators, including podcasters, videographers, live-streamers, YouTubers and beyond. All Audio-Technica bundles feature a microphone with mount, ATH-M20x professional monitor headphones and a new custom boom arm with desk mount. 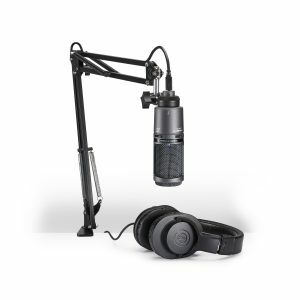 includes an AT2005USB cardioid dynamic USB/XLR microphone with ATH-M20x headphones and custom boom arm. The AT2020PK bundle includes an AT2020 cardioid condenser microphone, ATH-M20x headphones and custom boom arm. includes an AT2020USB+ cardioid condenser USB microphone, ATH-M20x headphones and custom boom arm. The AT2035PK bundle includes an AT2035 cardioid condenser microphone, ATH-M20x headphones, custom boom arm and shock mount. Earlier this year, Audio-Technica debuted a series of AES67-compliant products. The AES67 compliant products cover a range of products that include the ATND97a boundary microphone, the ATND8677a microphone desk stand, ATND8734a power module, the ATND931a gooseneck microphone and ATND933a hanging ceiling-mount microphone.